How Much Does a MRI Scan Costs in the Philippines? My dad recently needs to have a Magnetic Resonance Imaging (MRI) scan for his prostate problem. So I made a little research on how much does it cost to have one. Well, turns out, it depends on many factors such as which part of the body is to be scanned. There's also this technique called "MRI with contrast" wherein the patient will be injected with a chemical to make the scan clearer. For your information this technique of adding contrast is know as Gadolinium Contrast Medium. It adds cost to the procedure but with more clarity, the more you can trust the diagnosis. So, in my father's case, we had a Prostate MRI and I assume it's without contrast since he was never injected with the "contrast" chemicals. 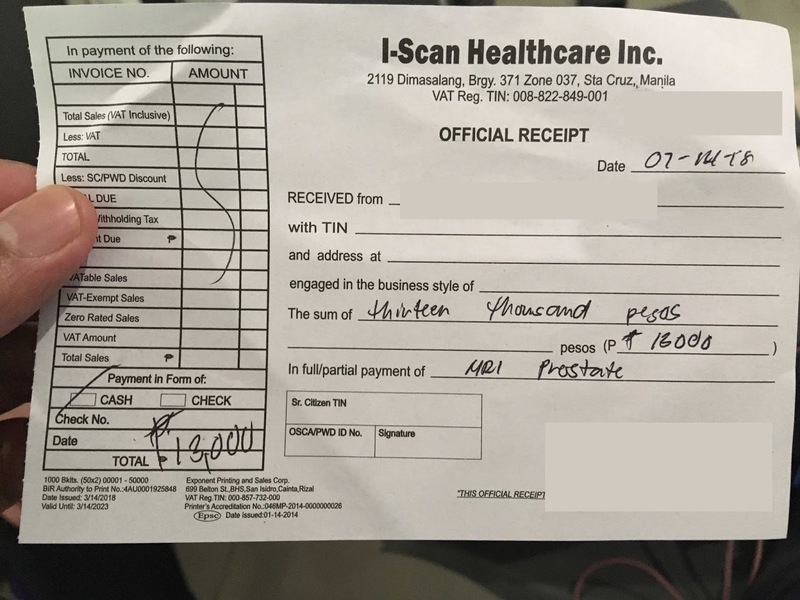 We got it in i-Scan Healthcare Inc here in Quezon City. The cost is 13000 Pesos. Please take not that the amount was just for the scan and the result will be read by a separate professional. Some laboratories offer this service (i.e. the reading) and they will add another grand or two to the price for the professional fee. I found some useful information from this blog, Medical Prices Data in the Philippines. The article about MRI pricing contains a sizeable comment section wherein people comment on their recent experience and how did much did it cost. The latest was just early this year so the prices is fairly recent. Our receipt. I covered the private details. If you recently had a MRI scan, please leave a comment and tell us what type of MRI scan did you do, when, what laboratory you got the scan from and how much did it cost you. Anonymous comments are welcome! This is just to help others find the cheapest possible MRI in their locality. May I know how much is the cost for whole body MRI? The hospital in Manila area is charging 50k? Mri for lower back how much its cost? How much the mrcp ?? Saan po mura mag pa mri? good morning I'm macky from Masbate and I have this problem with the left side of my hips it feels like the muscles there are in pain for almost 4 years now I undergo ultrasound and x-ray but it turns out normal the doctors who examined me referred me to go an MRI scan ! can it detect the kind of disease I experiencing? Hi there does the HMO covered mri in general? Pwede po bang ipa mri ang mother ko kahit walang referral ang doctor nya kasi nabonescan na sya at sabi ng doctor arthritis daw bakit wala po ba gamot sa arthritis or injection man lang? Anyone know the cost for both knees?